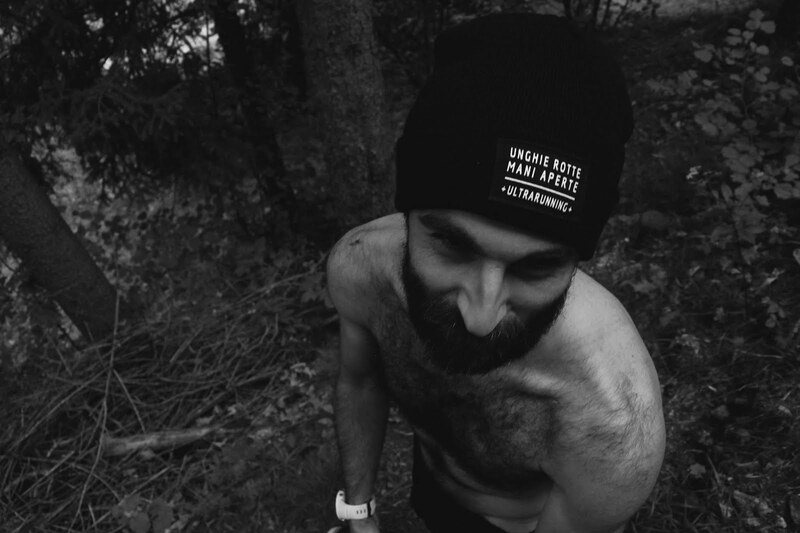 TheShirtlessRun: Weekly report 20-26 October...searching the trail. Weekly report 20-26 October...searching the trail. "I am now even more confident in my training plan and I am looking forward to waking up at 5 am every day until the next race! And then do it again". Well no, that's not mine. It's simply a quote from my mate @Luigi's Garmin Kingston Race's recap. I loved it and I decided to dedicate this week to this sense of passion, dedication and drive that makes a runner "something" pretty special. Well done dude, keep digging deep and chase it! And now, a super short week recap. Well, it's my first attempt with this kind of blogging, so have patience and deal with it anyway. That was in fact a special week, being in few words the first one of a kind of "plan" (man...I've always hated this word) looking far to SDW50 in April 2015. In my season pause, I've decided that Dr. Kasus ("make what you want when you want") wasn't this time enough, and I probably needed a bit of...yeah, strategy, to try to fix something that in the last season went not so good and to build a decent form for next Spring. On Monday, I've already written about that. Super easy run on the hills around home, 1 hour circa, meeting my favourite running mates (cows, horses, etc) and enjoing the smell of wine a stuff (grape-gathering time). Nice evening run anyway. On Tuesday...well, I've repeated. A bit less essentially (ca. 50 minutes) and flat (but yes, again on the ground). and again, try to hear it, I mean the connection between strides and breath, no mp3 or other devices. Just me, and I felt good. On Wednesday, hilly course but this time with Garmin, just to track the distances and prepare some circuits for next season. Yeah, I felt good again but...I have to say, at the end of the run (1 hour circa) I began to fee my feets a bit...heavy. 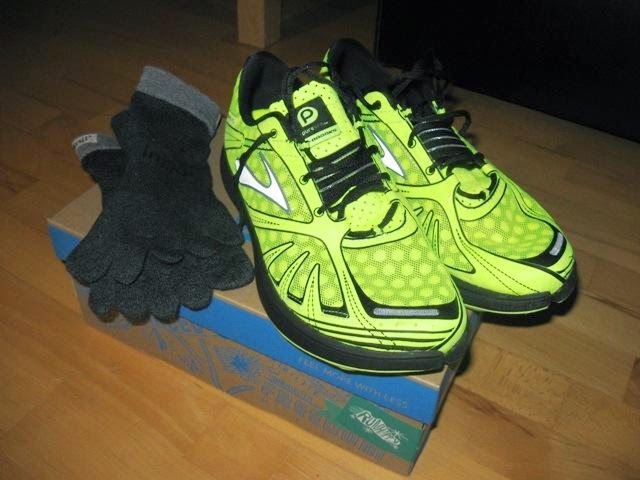 Don't know why, simply I've found my shoes (the extraordinary Brooks Pure Flow 3, that have this week destroyed the 1100 km total distance, and counting) like very little "stones" to my feet. Maybe was just that sensation of tired legs at the end of a 3-days streak, and I was still not habit after late-Sommer problems (fractured shoulder and calf's contracture). So, when I was just 400 mt far from home, I've decide to take shoes off and go home on my socks, essentially "barefoot" but protected anyway. I walked and I've even tried to run, veeeery light, a few meters, that walked again. I tell you what: it was one of the best feelings ever. I felt...I don't know, like "free", essentially I could feel again the ground under my feet, and the became very sensible to it. Nice experience. And I wanna to try it again. So on Friday (Thursday was a simply off-run day) I drove to Decathlon Mullhouse to find a pair of those Devil's tools 0-drop or stuff like that. And I've found 'em. 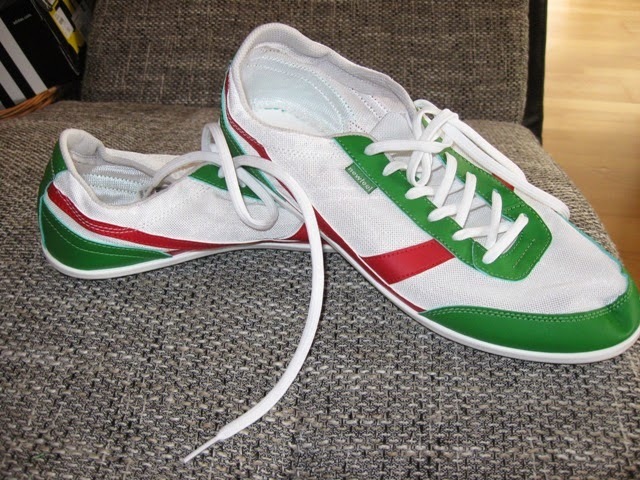 For 8 Euro (yep, eight euro), a pair of nice sisters, which aren't even running shoes, but have to admit, love the colours. I tried them, and I've felt them like a glove. In few words, I've decided to give natural running a possibility, also after a first read of Dr. Romanov's The Running Revolution, that gives a pair of good tips if somebody want to try to work with running technique and things like that. It's a very interesting book anyway, have a look if you can get it. But hey, I'm not saying that now I'll run only 0-drop or fore-foot, I know that it's a very long process, and I'm totally concentrated on my Downs target. But you know, curiosity is a desease to me, so...wait and see. Here comes the revolution...Admit, they "scare" me a bit. On Saturday (yep, today), I've finally taken my Pure Grit for a great trail running morning. 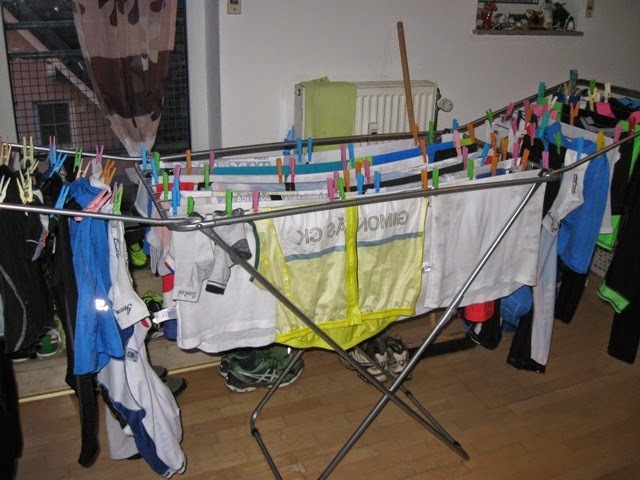 Because, in Worthing will be a trail-thing, a very long trail thing, and I need absolutely to begin to try nutrition, gear, shoes and...legs and be prepared to it. It was an amazing morning run. Bit more of 3 hrs., 30 km and a lot of fun. Schwarzwald is so awesome, especially with these unique Fall colours. Very hard to explain, you simply have to get the chance to visit it, to understand. It was such a long time that I didn't run consistenly, on the trails, on my own. Great experience, and here's a pair of pics about it. 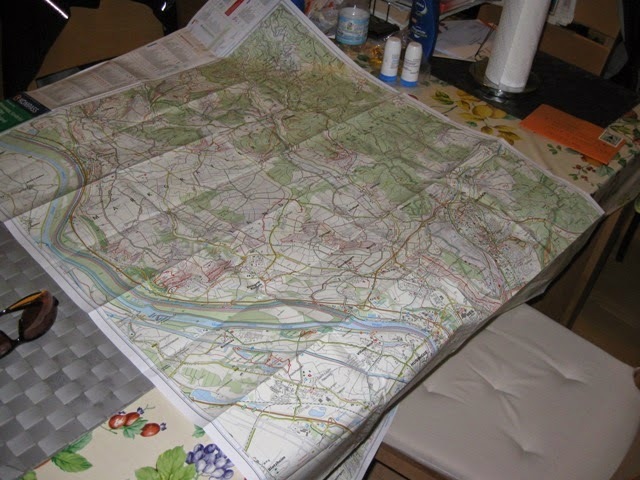 First of all...plannig the route...yep, I'm a maps addicted! "So..are ya telling me you're a runner...?" "Ya know what...I don't give a sh@t...Mooouuuuuhhhh"
Must say, I love this place! Have to say, originally weekend's program should be 20 km today and 10 km tomorrow, but at the end I've decided to get a single shot (an a bit more km's) because tomorrow I'll drive to Bayern for a Fall-holiday week (typical German, but very nice at this time of the year). Cakes (my birthday's coming), relax, walks and obiouvsly...run! 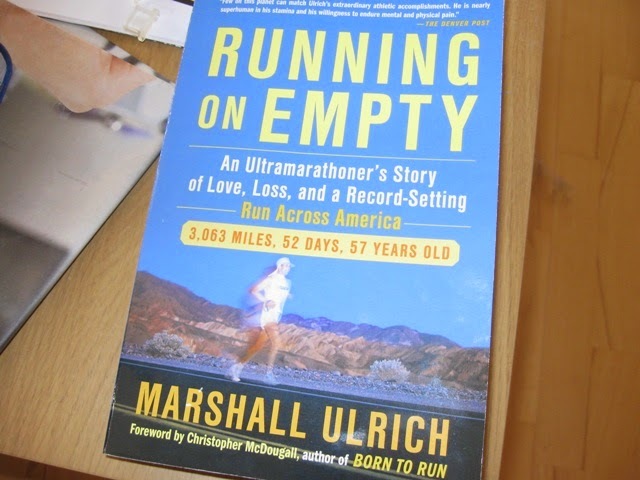 P.s: told about running books: this week I've finally got my copy of "Running on Empty" by ultrarunning legend Marshall Ulrich. Make something good: find and read it. One of the best running-life stories that I've ever read yet.